90º Studio Training Facility is the latest addition to Musos Corner, one of the largest music retailers in Newcastle, New South Wales, Australia. The ambitious project included adding a multi-purpose studio featuring a fully functional recording studio showroom and control room, as well as practice and training rooms. Allon Silove, director for the facility explained, "The fully functioning recording studio showroom is the first of its kind in Australia. We also incorporated a unique education and training environment for commercial audio courses and a technical services and solutions department. In the Studio Showroom, you can listen to and compare studio equipment brands just as you would a guitar or amplifier, a first in Australian music retail services." Musos Corner services nearly 200 schools every year and offers high quality commercial audio courses that cater to all levels of skill and interest alongside professional development programs for secondary teachers. Their technical services department also offers complete audio solutions. Every level from consumer through professional and high-end levels of the music and audio industries can find support at the facility. Training covers the full gamut of software training to hardware configurations, acoustic treatment solutions, and studio design. When it came to planning the facility, Silove brought in Daniel Sievert, product administrator for Amber Technology to consult. One of his primary concerns was to address the acoustics of all of the various spaces; but 90°'s owner Andrew Lindsay also put forth an intentional challenge. Lindsay chose to make the room configurations square, a less than optimal situation when it comes to acoustics. Silove explained the decision, "Most consumers, and nearly all educational facilities, only have pre-existing rooms with which to work with as music production spaces. Square rooms are far from being the ideal acoustic space configuration. Parallel walls, floors, and ceilings create a multitude of standing-wave issues; the Gyprock walls are also highly reflective and low frequencies have nothing to absorb them. We also had a very large glass viewing window between the control room and tracking room." Sievert produced a 3D room model for the acoustic treatment plan. "The design of all the rooms had to incorporate a substantial amount of infrastructure including cabling, television and computer screens, air-conditioning, ceiling and wall mounts, windows, and doors. I offered suggestions of treatment that would work harmoniously with the planned infrastructure whilst being flexible enough to re-arrange if layouts and infrastructure changed during the setup process." 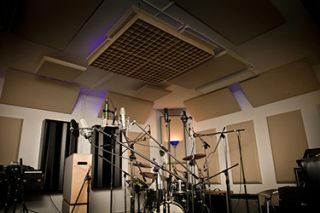 With their acoustic treatment and studio design training course in mind, Silove chose to outfit the facility with the Primacoustic professional line of acoustic treatments: "We knew we could use Primacoustic products to achieve two workable audio production spaces that would demonstrate how anyone could create a complete and affordable studio environment, regardless of their current space." Sievert explains how he overcame some of the design challenges in the spaces that would be typical in traditional pre-existing rooms: "The main challenge from a layout perspective was the positioning of door and windows in the recording and control rooms. The proximity of some doors to corners of the rooms meant that Maxtraps (bass traps) could not be used.The guys at 90º Studio cleverly solved this problem by using Fulltraps mounted flat on the wall in the affected corners.The front wall of the control room was designed to have at least two large screens mounted on it so the size and positioning of treatment had to take that into account. The solution was a mix of Scatter Blocks and Control Columns." Regarding the end result of the treatment plan, Silove stated, "The 90º Studio Tracking room is now a relatively 'flat' acoustic space, able to facilitate an entire band-at-once session while still maintaining a comfortable SPL for working and performing. Our control room's acoustics now allow us to hear the true quality of our large range of high-end studio near-field monitors which in turn enables us to accurately demonstrate the unique ability of our facility to allow customers to listen to and compare all elements in the signal chain. "We also decided to apply the acoustic treatment to our Lab room (housing 6 computer/digital workstations and a Master/Teacher Station) and the remainder of our adjoining music tuition rooms. The outcome has been a very successful conversion of ordinary square rooms to more usable and acoustically balanced music and production spaces." Sievert also offers his opinion on the spaces after treatment. "It was definitely clarity of the sound in the rooms that I was most impressed with. The rooms still have a pleasant 'space' to their sound but the Primacoustic treatment seems to be removing any ring or echo. The visual effect of the treatment in the rooms is also very impressive. I'm told that the Primacoustic treatment is generally the first thing clients ask about when they see the studio."